The Manzini RhinosThe Manzini Rhinos raised the trophy at the first Inyeti 7's of 2009. The tournament kicked off at 6pm on a marvellous warm Friday evening. All four teams participating in the tournament brought plenty of support to cheer them on and the supporters were not let down. Mahlanya PrimaryThe Vondo's Rugby Club held their U/14's Inter Schools Rugby Tournament on Wednesday. The three schools participating in the tournament were Mphetseni, Mahlanaya and St Andrews. The tournament kicked off at 1pm and all three schools brought plenty of supporters to cheer them on. St Andrews PrimaryThe Union Development Coaches held a schools Coaching Day at the Vondo's Rugby Club in preparation for the Vondo's Inter Schools Tournament. Mphetseni, Mahlanya and St Andrew's were the three primary schools who attended the Coaching Day held at the Vondo's ground in Malkerns. The Presidents Select team "InyatsiThe Swaziland Rugby Union's Presidents Select side "Inyatsi" returned home on Saturday from the Malelane Rugby Festival beaten but by no means down. A jubilant Inyatsi Coach, Steve Reynolds said he was very happy with the team's performance against a strong Komatipoort First team. The Swaziland University Rugby team returned from Lesotho with a marvellous win over hosts Lesotho last week. The Swazi team travelled down to Lesotho on Friday and had four days in Lesotho to prepare for the big match against their hosts on the following Wednesday. The University side Coach Mario De Sousa had been working with the team for three months prior to the University games and on leaving for Lesotho said he was happy with the squad and very confident they would bring home the trophy. 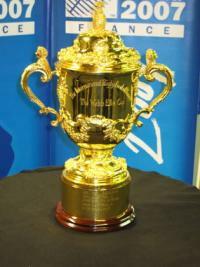 Webb Ellis Cup2009 will see the first African country outside of South Africa to play host the Webb Ellis Cup. The Cup will be making the short trip to the Kingdom courtesy of the South African Rugby Union and as a part of a fund raising campaign by the Swaziland Rugby Union to raise much needed funds for the Union's Rugby Development Programme. Development Coaches with new KIA SportageThe Swaziland Rugby Union's Development Programme received a huge boost today when the SKRUM Programme took delivery of the new KIA Sportage. Union President, Michael Collinson said. The Sportage will allow the Development Coaches to get out to schools everyday and coach more and more Rugby.